The Nissan Sunny is an automobile built by the Japanese automaker Nissan from 1966 to 2006. In the early 1980s, the brand changed from Datsun to Nissan in line with other models by the company. Although production of the Sunny in Japan ended in 2006, the name remains in use in the Chinese market for a rebadged version of the Nissan Latio. The first Datsun Sunny, exported as the Datsun 1000, was launched in September 1966 with two body styles, a two-door sedan (B10) and a van/station wagon (VB10). The Sunny was an all-new product built on a dedicated platform called the "B" series that benefited from Nissan's production of small cars since before the war and combined engineering efforts from newly acquired Aichi Manufacturing that met the goals set by Japan's Ministry of International Trade and Industry "national car" program. These were available in both a "Standard" and "Deluxe" version, featuring drum brakes, conventional leaf springs at the rear and wishbone type independent front end. The front end used a single transverse leaf spring. In Japan the car was sold at a dealership sales channel established just for the Sunny, called Nissan Satio Store The Sunny was introduced in the same year that the Toyota Corolla and Subaru 1000 were introduced. In December 1965, Nissan held a national campaign in Japan to name its newest product in a mail-in ballot, and after receiving over eight million submissions, the name Sunny was chosen after having been suggested 3,105 times and was announced on 19 February 1966 by Yoshisuke Ayukawa, Nissan Motors founder. The car featured a four-cylinder in-line engine, the A10, with a total displacement of 988 cc and a four-speed gearbox. The 1968 model, introduced in October 1967, added to the lineup the four-door sedan (B10) in both DeLuxe and Standard form. October 1968 saw the new 1969 models released with a new coupé (the KB10) added. Marketed as the "Sunny Coupé" in Japan, it was available in a wide variety of levels from "Standard", to "GL" (Grand Luxe). The range of factory options and accessories was by this time vast. Total horsepower in the 1968 model was claimed to be 62 hp (46 kW) at 6,000 rpm. The engine displacement was kept below 1.0-litre to keep it in the lowest Japanese road tax bracket and encourage sales. 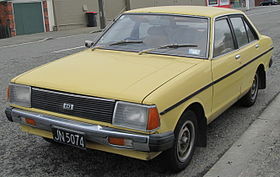 The only other country that seems to have received the coupé is Australia, where it was marketed as the "Datsun 1000 Coupé". It was well equipped, and was available only in the Deluxe level of trim. The Australian Deluxe model came standard with many inclusions that were available only as options in the Japanese model. The engine in the coupé had higher compression, a different Hitachi carburettor, and a dual outlet exhaust manifold. These changes increased its power output to 66 hp (49 kW); a 4 hp, or 6.5% increase over the lesser models. Unlike the sedans and wagons, the coupé was only ever made in right drive. July 1969 saw the release of the slightly different (cosmetically) 1970 model year, which left the 1969 model year run at only nine months. No additional models were added, and production ceased in December 1969, cutting the 1970 model year run at only six months. The Datsun Sunny truck debuted in February 1967 and was the light commercial truck variation of the B10 passenger models. It was based on the VB10 van chassis, and is a body style which is sometimes referred to as a "coupé utility", as the bed is not separate from the passenger area. The introduction of a pickup truck based on the Sunny gave Nissan Saito Store and Nissan Cherry Store Japanese dealerships the opportunity to sell a commercial vehicle that was originally only offered at Nissan Bluebird Store. The 520 series Datsun Truck shared its platform with the Datsun Bluebird, plus the larger Nissan Junior sharing an engine with the Nissan Cedric; Nissan decided to duplicate the success it had with a Bluebird-based pickup truck for the new Sunny platform. The Sunny was engineered by newly acquired Aichi Machine Industry Co., Ltd., and gave the new acquisition the ability to demonstrate their profitability to their new Nissan owners. The Sunny truck dimensions were in compliance with Japanese Government dimension regulations and the small displacement engines reduced the annual road tax obligation. The B20 used the same wheelbase and running gear as does the Datsun Sunny VB10 van, and shared its dimensions. The B110 made its racing debut at the Fuji 200-mile race on 23 November 1970 in the TS1300 class, a class dominated by the Toyota Corolla; only one works Nissan challenged Toyota yielding a victory for driver Makoto Suzuki. In the UK the Datsun 1200 was the first Japanese car to sell in large numbers, being the company's best seller there when its sales soared from just over 6,000 cars in 1971 to more than 30,000 a year later. The 120Y model, launched there in the autumn of 1973, helped take the brand from strength to strength, as did the smaller Cherry models. It was well equipped for its price with disc brakes and reclining front seats. This model established Datsun as the top Japanese exporter of cars to the UK. The New York Yankees used a Datsun 1200 as a bullpen car in the 1970s. In North America, Coupé total sales were 89,541 and two-door sedan total sales were 43,761. The B120 commercial truck debuted in February 1971, based on the B110 passenger car chassis. The B120 used the same wheelbase and running gear of the Datsun 1200 sedans, coupé and wagon models. Initially it used the same stainless steel grille as the 1200 sedan, and the rectangular gauges of the Standard model B110s. Both regular (B120) and long-bed (GB120) models were offered. After the 1200 car series ceased production the B120 continued. In certain markets such as South Africa, the B120 was actually badged as the "120Y" and sold as part of the updated 120Y range. The It was assembled locally and marketed in New Zealand during the 1980s in two trims: "RoadStar" and "SportStar". It was capable of 49 mpg‑US (4.8 L/100 km; 59 mpg‑imp). B120s were not sold in North America, partly due to the US "Chicken Tax" and partly because perceptions of vehicle size meant that the 620/720 series were considered small pickups. NOx Conforming (emission controlled) models RB122 and RGB122 the A12 engine. The Sunny Truck was sold in South Africa for a total of 37 years (launched there in 1971). The B140 variation, with 1.4-litre A14 engine, was manufactured up until 2008 by Nissan South Africa as the Nissan LDV 1400 (Light Delivery Vehicle). The 1400 Bakkie saw many changes in its long career. The main ones were a five-speed manual gearbox, power assisted disc brakes, and a roof height extension to accommodate taller South Africans. A sport model of the 1400 Bakkie was marketed as the Champ. This model had appropriate side striping, bucket seats, a tachometer, and central handbrake. This vehicle had two popular local nicknames, either 1400 or kanniedood which translated from Afrikaans means "cannot die", a testament to its reliability. The 1400 Bakkie was assembled by Nissan in Rosslyn, South Africa (Nissan). Another assembly location for the model was the AYMESA plant in Quito, Ecuador which assembled it under the Datsun brand name as the 1200 PickUp. The 1400 Bakkie was replaced late in 2008 by the NP200, a rebadged Dacia Logan Pick-Up. A major departure for the Nissan bakkie is that the new model is front-wheel drive (FWD), whereas the original was rear-wheel drive (RWD) – a major selling point of the vehicle in South Africa where it was the only RWD bakkie in its class for many years. A long-standing marketing credo was "put the power where the load is". Exported as the Datsun 120Y and Datsun B-210 (in North America), the third generation (1973–1978) Sunny was extremely popular as it debuted during the 1973 oil crisis. It was first shown on 1 May 1973 in Japan, as the 1.2 or the 1.4-litre Excellent. Both engines were offered in two different levels of output, from the lowest powered 68 PS (50 kW) 1.2 to the 95 PS (70 kW) Excellent GX Coupe. Six body styles were offered: the four-door sedan, two-door sedan, two-door fastback, three-door wagon, five-door wagon, and a three-door van. The coupé retained its fastback styling, but now featured a full hatchback door rather than the small trunk lid of the previous generation Sunny. The wagon and van were not offered in North America. In 1975, Japan models were fitted with emission control technology, called Nissan NAPS to be in compliance with Japanese Government emission control regulations enforced that year. The related Sunny Excellents continued until 1976 as PB210 models, at first fitted with a 1.4-litre L14 engine. American market B210s were the first Sunnys to have the larger 5 mph (8 km/h) collision bumpers, due to the USA's safety standards at the time. Other markets continued with the more tightly-fitted chrome bumpers. In most markets, the B210 line featured as the only engine option a re-designed A12 engine. As usual for Japan, the wagon (three- and five-door models alike) was marketed as a van for commercial use, where it was only available with the lowest-powered 1.2 engine (VB210). The van, in its lowest standard equipment level, came equipped with a three-speed manual gearbox with a column-mounted shift lever. The Datsun B-210 continued to be the fuel-economy leader in North America and it was one of the least expensive cars available. This was in part due to the light metal; small A13 or A14 engine with OHV technology and a very basic vinyl interior used in its construction. Introduced for 1974 with a 1.3-litre four, this was replaced by a larger and more powerful 1.4-litre version for 1975. This engine remained in use, continuing to be installed in the next generation B210. At the time, their body styles were popular with buyers – mainly the hatchback coupé as the sedans were considered by some to be less appealing. Datsun dealers were instructed to describe the coupé as having "the image of a Mini-Z-Car". The 1978 B-210 (American model) with five-speed transmission was rated by the United States Environmental Protection Agency at 50 mpg‑US (4.7 L/100 km; 60 mpg‑imp) highway fuel economy. Road & Track was somewhat critical of the B-210 in their 1975 test. They criticized the "modest performance" of the "peppy" engine, but were impressed with its 27 mpg‑US (8.7 L/100 km; 32 mpg‑imp) fuel economy. B210 pricing started at US$2849 that year. The "Datsun Honeybee" was a special edition consisting mostly of appearance parts. Nonetheless, the Honeybee is now considered a collector's car among Datsun enthusiasts. 1975–1978: A14 engine, 1.4 L (1397 cc) OHV I4. Power in 1975 was 70 or 68 hp (52 or 51 kW) (SAE Net) in 49-state versus California trim - the regular version took leaded fuel and depended on an EGR system for air cleaning, while the unleaded California cars have a catalytic converter. Gross horsepower ratings are 80 and 78 respectively. Despite earlier misgivings, the 120Y, when finally launched in New Zealand in 1974, proved popular with Nissan NZ. It eventually assembled some cars in a temporary CKD plant in the Auckland suburb of Mount Roskill, before the new plant in Wiri was completed later in the decade. Four-door sedans and three-and five-door wagons were built locally and were supplemented by some coupés imported built-up from Japan. The 120Y was assembled from kits in Melbourne, Australia and boasted disc brakes (although not power assisted), alternator, 4 speed gearbox, radial tyres, radio and mud flaps as standard, most of which were options on other makes. The modest performance and strictly conventional design were offset by excellent fuel economy and a better standard of build. The 120Y was sharply criticized by magazines such as Wheels of Australia, which felt that it offered no true improvement on its predecessor. That was not surprising given that the B110 platform was carried over, but used a slightly revised A12 engine. Like some Nissans of this period, it was considered overstyled. In New Zealand and Australia there was also the "Datsun SSS" limited edition B210, which had minor aesthetic differences to the regular B210. In the South African market the B210 was assembled locally from December 1975 until 1983, replacing the previous "Datsun 1200". South African "Y-series" cars, as they were called locally, also featured L14 and L16 engine options, as well as two special editions of B210 coupé, badged as the 140Z and 160Z. The 140Z featured a high performance camshaft, freeflow exhaust and twin 40 mm Dell'orto carburettors, while the 160Z featured twin Hitachi (SU type) carburetors. Both had four-speed transmissions. The standard 120Y has the 1171 cc A12 engine as already used in the 1200, with 49 kW (67 PS; 66 hp) at 6000 rpm. The well-equipped 140Y GX had a 1428 cc 70 kW (95 PS; 94 hp) L14 motor and was also available as a two-door liftback coupé. The only other bodywork available at the time of introduction was a four-door sedan; later a four-door wagon joined the lineup. All South African Datsun Y's received the longer Sunny Excellent front sheet-metal, allowing the fitting of the L14 engine. In October 1976, a version of the 140Y with a three-speed automatic transmission appeared, which had a 62 kW (84 PS; 83 hp) engine. During 1978 the Y-series received a facelift, which mostly consisted of a retouched front grille. Datsun-Nissan South Africa also decided to fit the bigger L16 engine. This motor, now with DIN ratings, produced 57 kW (77 PS; 76 hp) in GX specifications and 70 kW (95 PS; 94 hp) in the 160Z. The 140Y sedan received the new A14 engine, while the 140Y station wagon retained the earlier L14 unit. The 160Z appeared in November 1978, with 120 cars built that year, and 121 built in 1979. When introduced in the UK, the 120Y quickly gained popularity, further strengthening Datsun's position, helping it to gain second place amongst foreign imports. The car's popularity was helped by high equipment levels for a car of this size, while also being competitively priced as well as Datsun cars have a reputation for being reliable, while at the same time UK-manufactured cars were in short supply due to the regular strikes and stoppages affecting British car plants. British Leyland was particularly hard hit by these crises, while at the same time several of its model ranges were gaining a reputation for being unreliable and badly-built. This is the last Sunny sold under the "Datsun" brand in Japan. The final rear-wheel-drive Sunny from model year 1978 to 1982 featured numerous variants, including a fastback station wagon as well as more squared-off, utilitarian models with three and five doors, a coupé, and two- and four-door sedans. They were first introduced in October 1977, going on sale on 21 November in Japan. At home they only received the new A12A engine and the slightly larger A14, although the Van continued to receive the earlier, smaller, A12 engine. The "Excellent" trim package was discontinued as the top level model, and the B211 van continued to be built for a little while longer. In Japan on February 1978 the Sunny Coupe 1400SGX-E and the 1400GX-E appeared, as a replacement for the previous Sunny Excellent Coupe. The "E" denotes multiport fuel injection, an option offered only in Japan. This generation was also the last utilizing front engine and rear-wheel drive powertrains. These models appeared with Datsun 120Y, 130Y, 140Y and 150Y badges in some markets (reflecting the engine size) though Sunny was increasingly used for export, too. The North American version was marketed as the Datsun 210. The B310 was known for its high equipment levels and build quality at the time. It was available with the same A-series engines as its predecessor although the B210's optional 63-series five-speed transmission was replaced with the more compact and lighter 60-series unit, with a standard gear pattern. On all body variants except the Van and "squareback" wagon, the leaf spring rear suspension was replaced by a more advanced coil spring four-link configuration, while the front had struts with coilover springs. Other than that, the chassis was very similar to that of the B210, albeit with a beefier front suspension and a relocated fuel tank in the sedans. It was now beneath the floor of the trunk, freeing up more space for luggage. The body was designed to provide fewer moisture traps, helping protect the car against rust, while added width meant additional space, particularly for the rear seat passengers. In 1980, the B310 was given a mild facelift, with a smoothed off front end, a grille with square headlamps, and a redesigned dashboard. In November 1980 the A12A and A14 engines were replaced by the marginally larger A13 and A15 versions in the Japanese markets. At the end of 1981 passenger car versions of the B310 were replaced by the front-wheel drive B11 Sunny, although the Vans continued to be built for a few more years. With the end of passenger car production in October 1981, the Van models chassis codes was changed and they became the VB312 series. In North America, the only wagon offered was the fastback version. In Japan, this fastback wagon was a special model called the Sunny California, aimed at private buyers unlike the square-backed 3-and 5-door Sunny Van (although for the Japanese market these vans were always fully glazed and usually had a back seat) meant for the long-standing Japanese commercial wagon market. In most other markets the more traditional two-box wagon was offered, either alone or alongside the fastback, and some countries where "no rear side glass" was part of a legal definition of a "light truck" got panelled-in versions of the three-door. The van versions also differed in that they retained the leaf spring suspension from the B210, and in most markets had a more spartan interior trim with vinyl covered seats. The five-door van was discontinued in November 1982 when the new and even boxier Nissan AD range was introduced. In July 1983 this appeared in a three-door version, meaning that the VB310 was retired. This model marked the first and only time the "Sunny" name was used in Australia. It was assembled there by AMI. This chassis, along with the A10 chassis on the 160J/Violet/Stanza formed the basis for the S110 chassis on the Nissan Silvia. The 210 was available in North America as a two- or four-door sedan, a five-door wagon (the sloping fastback style), or as a three-door hatchback coupé. At the time of introduction all models, excepting the wagon with the automatic transmission, received the carryover 1.4 liter A14 engine with 65 hp (48 kW). The automatic wagon (soon all wagons) received the somewhat larger A15 engine with 67 hp (50 kW). New for 1981, the special "210 MPG" model was a small-port A14 with five-speed overdrive transmission and achieved 40 mpg‑US (5.9 L/100 km; 48 mpg‑imp) per US standards. For 1981, this was the only 1.4 available. All other versions excepting the standard 1.2 received the larger 1.5. Even the most powerful 1.5-litre option produced only 65 hp (48 kW; 66 PS), being strangled by the required desmogging equipment. The smallest 1.2 was only available as a four-speed, two-door sedan with very basic equipment. The 210 continued to be available until April 1982, when it was replaced by the Sentra, a rebadged version of the B11 Sunny. In Taiwan, Yue Loong continued building the B310 series until the 1990s as a lower priced alternative to more modern Sunnys. Originally introduced as the YLN 302, with SD or DX equipment (Standard, DeLuxe) it underwent a facelift in 1981 in parallel with Nissan's Sunny, becoming the YLN 303. After another facelift (in 1989), it became the YLN 303S. The station wagon was also offered in Taiwan, as the YLN 303W. The Yue Loong-built B310s were only ever available with the 1.2-litre A12 engine. Introduced in late 1981 (at the Tokyo Motor Show), the B11s were the first front-wheel-drive Sunnys, predating by a year and a half the switch to front-wheel drive by their main Toyota Corolla rival, and were exported to the United States as the Nissan Sentra from the 1982 model year onwards. European sales began in May 1982, with this version of the Sunny going on sale at a time when front-wheel drive was quickly becoming the most popular layout on family cars in Europe. The B11 series shared its engines and much of its underpinnings with the Nissan Pulsar (N12) which launched around the same time, effectively providing the hatchback body style in this size class which in the European market was becoming the widely preferred configuration. Because the Sunny and Cherry/Pulsar had grown substantially to fill this market need, the supermini size class was filled by the Nissan Micra/March that also launched the same year. Ultimately, the Sunny and Cherry/Pulsar lines converged in the European market for the N13 generation in 1986. The chassis code returned to the original "B" designation, then added "11" to signify a front wheel drive platform. The B11 was the first Sunny to be available with a diesel engine, the 61 PS (45 kW) CD17 of 1.7 litres. Most markets received 1.3 or 1.5-litre four-cylinder engines, although for some markets with strict taxation (such as Greece), the 50 PS (37 kW) 1-litre E10 engine was also available. The 1.3 and 1.5 as sold in Europe have 60 and 75 PS (44 and 55 kW) respectively. The fuel injected 1.5 L turbo was introduced to Japan only September 1982, offered only in the 3-door hatchback body style, and was called the "Sunny Turbo Leprix", and was rarely exported. The installation of a turbo on the top level model wasn't necessarily to market the Sunny as a performance sedan, rather it was to reduce emission tax liability for Japanese buyers so as to increase the fuel efficiency and reduce emissions as a result of the Japanese Government having passed emission control regulations in the 1970s. The turbo and the diesel were both later additions to the lineup, having been presented in September 1982. The Sunny Turbo Leprix was sold in the United Kingdom as the "Sunny Maxima Coupe", alongside the "Sunny Maxima" sedan. A further spin-off from the Sunny line was the Nissan Laurel Spirit (in Japanese), which was essentially a rebadged and better equipped Sunny sedan designed to capitalize on the premium image of the larger Nissan Laurel. The Laurel Spirit was exclusive to Nissan Motor Store which sold the Laurel, while the Sunny remained exclusive to Nissan Satio Store. The Laurel Spirit was offered in four trim packages, starting with the LT, LT-G, LF, XJ, and the XJ-E denoting a fuel injected E15E engine. In 1983 the top level XJ was installed with a turbocharger, designated as the Laurel Spirit Turbo XJ. The Laurel Spirit was exported as the "Nissan Sunny Maxima SGL", which was sold in limited numbers in the United Kingdom. This was not in any way related to the much larger "Bluebird Maxima" (which was simply just sold as the "Maxima" in the United States). The "Sunny Maxima" line consisted only of upgrades such as a sunroof, enhanced exterior trim, only available with a five-speed manual, chrome tailpipe, dual waveband radio meeting United Kingdom radio authority specifications, and deluxe carpeted floor mats. In 1982, the Sunny platform was used to introduce a new MPV body style in Japan, called the Nissan Prairie. It was introduced at Nissan Bluebird Store locations and went on to be sold globally, although this concept did not take off in Europe until the huge success of the Renault Scénic in the late 1990s. The B11 series was regarded as one of Nissan's most modern ranges at the time, and was the first to abandon the Datsun name formally (though a small 'Datsun' still appeared on boot lids for the first two years). The wagon was known in its home market as the "Nissan Sunny California", and Nissan installed the turbocharged engine in October 1983 for Japanese customers only. It was launched in late 1981 and continued into 1985. After the succeeding B12 had been presented, the B11 Sunny soldiered on as the "Sunny 130Y" as a lower-cost alternative in certain export markets, including Malaysia; production there continued well into the nineties. While a hatchback version was available for a little while in Japan (and very briefly in North America), this body style was built in comparably small numbers as the Pulsar generally replaced the hatchback in most markets. The two-door sedan was only sold in North America, with Sentra badges. The station wagon model remained in production until 1990, as no estate version of the next generation Sunny was produced. The B11 was the first Sunny to be badged in Mexico as the Nissan Tsuru, a nameplate used until 2017, when it was discontinued, and replaced with the Versa. As usual, Nissan's Taiwanese subsidiary Yue Loong assembled a local version of the B11 Sunny. It was available as a four-door sedan or a five-door wagon, with 1.2-, 1.3-, and 1.5-litre engines. It was marketed as the YLN 311 SD or GX, depending on equipment levels. Taiwanese Sunnys were fitted with the larger bumpers as used in the North American markets; it is unknown why this is the case. The Sunny five-door station wagon was also introduced as a delivery van called the Nissan AD van, using the E15S, the E13S, and the CD17 diesel engine. For the Sunny sold in Europe between 1987 and 1991, see Nissan Pulsar (N13). Introduced in September 1985 at the Tokyo Motor Show, the B12 was not as widely exported, apart from the station wagon model and to some extent the RZ-1 coupé. This line is characterized by its squared-off styling, which was rather unfashionable by the mid-1980s. The angular styling was insisted upon by Nissan's design chief at the time and contributed to the automaker's increasingly poor sales of the period. A four-wheel-drive variant was introduced during this generation. In October 1986, European markets saw the B11 Sunny replaced by a rebadged N13 Pulsar in hatchback and saloon form (the hatchback replacing the previous N12 Pulsar, which had been sold as the Cherry in this market). These were sold alongside the B12 Sunny estate and coupé. In some markets, such as Greece, the N13 Pulsar retained the "Cherry" nameplate. In the UK the B12 was sold as the Nissan Sunny Estate with a 1.6L engine. The B12 Coupé (RZ-1) was also imported, with either 1.6 L or 1.8 L 16v engines. When first introduced, Japanese-market Sunnys received 1.3 or 1.5-litre E-series petrol inline-four engines, or the 1.7-litre CD17 diesel unit. In mid-September 1987, the E15 was replaced by the new GA generation, cleaner and with more power. This was also the first Sunny to become available with optional anti-lock brakes. A twin-cam 1.6 was also added, at first only to the sporting 306 hatchback but later also in the four-door sedans. Abroad, a few other engine variations were also available, up to a 1.8-litre twin cam in Europe. In Kenya (East Africa), the B12 was imported and marketed as Sunny and came with a 1.3- or a 1.5-litre petrol engine. The 1.3-litre version is assembled locally (1.3 SLX). In Mexico the B12 Sunny was known as a Nissan Tsuru II (as the first generation was simply called Tsuru), this model was later also exported to Canada where it carried "Sentra" badges. The "Sunny California"-style fastback was the only B12 wagon; the more upright B11 "Sunny Van" continued in those markets where it was previously offered. The station wagon continued in its second generation as the Nissan Wingroad and the commercial AD Van. The B12 series Sentra remained the mainstream C-segment Nissan in North America throughout its run, although the models available dwindled over the years. At launch, sedans were available in two-door base or XE or 4-door XE or GXE models, along with two trim levels each of the coupé and FWD wagon, a short-overhang three-door hatchback and an AWD wagon; by 1990 only one model each of the coupé, four-door sedan and FWD wagon, plus two two-door sedans (one with the same trim as the others and one extra-basic price leader) remained. In Malaysia, it was known as the Nissan Sentra Super Saloon (early version) and came with the E16 engine. It was often used as a taxi and rental car. The B12 was replaced there by the Pulsar N13 in 1987. The Sentra badge was also used in a few other markets such as the Philippines and New Zealand. In Japan, the Nissan Laurel Spirit continued to be offered at Nissan Motor Store locations as a Sunny-based companion to the larger, more luxurious Nissan Laurel, with all-wheel-drive added to the Laurel Spirit's option list. The styling of the Laurel Spirit drew heavily from the larger Laurel, to further distance it from its more humble Sunny counterpart, and included the hood ornament from the Laurel to the smaller car. To help set it apart from its lower-priced brethren, the Laurel Spirit was only available with four-door bodywork in higher equipment levels, and not with the 1.3-litre engine. In February 1986, Nissan introduced the Sunny RZ-1 coupé, with RZ representing "Runabout Zenith-1", as Nissan was already using the "Z" for its sports car, the Fairlady Z. The Sunny RZ-1 replaced the Sunny Turbo Leprix coupé. The RZ-1 was sold in Mexico as the Nissan Hikari, which is Japanese for "bright" or "sunny". It was marketed as a completely different model from the Tsuru (Sunny sedan) and it was Nissan's sports flagship car as it was even offered with a low-boost Turbo. As with previous B series Sunny generations, the chassis was common with the wagon and sedan, with specific appearance to the RZ-1, while maintaining the traditional fastback associated with the Sunny Coupé. The Sunny hatchback and sedan were introduced with a square appearance, while the RZ-1 was more angular, with a more sharp appearance. The interior could only accommodate four people, with a black mask between the front headlights, retaining the strong slant angle, adding blistered front and rear over the wheels, and a wrapped around window treatment for the rear hatch, that had hit a different personality hatchback and sedan. The angular approach was also used on the Nissan EXA, which appeared internationally at the same time, and earlier on the Nissan Leopard. Initially, the engines offered to Japanese customers were the E15S type (1500 cc straight-four SOHC), and the E15ET type (a turbocharged, fuel injected version of the same), but in August 1986 the CA16DE type (1600 cc straight-four DOHC) was added. Nissan introduced something called the "TWINCAM series" and the "TWINCAM NISMO", this included special suspension and aero parts that offered Japanese customers a customized specification, offering special interior appearances, including power windows that were not available on lower trim packages. In export markets it was mostly sold as the "Sunny Coupé", but export markets generally did not receive the higher trim packages available in Japan. In Europe, the Sunny Coupé was also available with the larger, 125 PS (92 kW) 1.8-litre 16V twin cam CA18DE engine. In an unusual move, this was more powerful than any option available in Japan, where such a model was seen as a possible threat to sales of the Silvia series. A limited number were also manufactured in South Africa with this engine. It is speculated that production of this model were 720 units with 131 hp (98 kW) at 6400 rpm and 159 N·m (117 ft·lbf) at 5200 rpm, although this number has never been confirmed to this day. For the Sunny sold in Europe between 1990 and 1995, see Nissan Pulsar (N14). The B13 was introduced in 1990 and retained many of the B12's ideas but in a more rounded, up-to-date body. It was particularly successful in the United States where the sports model two-door Sentra SE-R was marketed by Nissan of America as a latter-day BMW 2002. The car continued in production in Mexico until 2017, where it was sold as "Tsuru", for domestic and export markets (in Chile and Peru as Nissan V16), and is quite popular among cab drivers for its reliability and low maintenance costs. It was also part of the image of the former Mexico City mayor Andrés Manuel López Obrador, who was driven around with a white Tsuru. In Taiwan, it is known as the Nissan 331. The Nissan Sunny California wagon was discontinued and replaced with the Wingroad, a small family wagon based on the Sunny AD commercial delivery van. In Mexico, the Nissan Tsuru was until 2017 the best-selling car in its category, as it is much bigger and cheaper in maintenance than its direct competitors: the Volkswagen Pointer and the Chevrolet Chevy C2. The 2007 model was available in 2 trims: the GS 1 (base) and GS 2. Both trims use a 1.6-litre 16-valve (GA16DNE) engine producing 105 hp (78 kW) and can be equipped with an automatic gear-box and air-conditioning (Tsuru GS 2). A new Nissan Tsuru GS 1 costed approximately US$9,500. It was discontinued in may 2017 due to being unable to meet updated car safety regulations. A special edition called Buen Camino was sold to celebrate the end of the Tsuru in Mexico according to Nissan there is no plan for a successor for the Tsuru with the Versa being sold the year 2018 as its successors. In Malaysia, known as the Sentra Super Saloon with GA16DE fitted engine with two versions (first and last models[clarification needed]), it is widely used as a taxi in Genting Highlands, due to its engine durability and fuel efficiency in such conditions. In Japan, the Laurel Spirit was renamed the Presea, continuing to be a luxury-based Sunny companion to the Laurel, both exclusive to Nissan Motor Store locations. The Sunny Sports Coupé was replaced by the ovoid NX internationally. The AD Wagon remained available. This was sold as the Sunny Traveller/wagon in Europe and as Nissan Tsubame in Mexico. The B14 Sunny and Sentra appeared in December 1993 and were produced until 1998, and featured four-wheel-drive variants. Other than Japan, this variant was produced in Karachi, Pakistan through a joint venture between Ghandhara Nissan and Nissan Japan till 2001 for the local and export markets. In this generation, the station wagon was supplied to Mazda under an OEM deal as the Familia Van. The Nissan Wingroad range appeared as a spin-off of the Sunny line in Japan, denoting a highly specified station wagon that replaced the Nissan Sunny California. Both the Familia and the Wingroad had different front and rear ends compared to the wagon that was exported. The luxury version of the Sunny, called the Presea, continued to be offered at Nissan Motor Store Japanese dealerships. Nissan Mexico sold versions of this as the Sentra with a 1.6 engine GA16DE from 1995 to 1997, GA16DNE from 1998 to 2000 and 2.0 engine (SR20DE) in the GSS version (top of the line). Thailand and other selected Asian countries had this model of B14 from 1994 until 2000 with a few minor changes along the way. First minor change shows when the rear changes to split the red strip into two sides, next the face changes in a few years with a small ridge i the middle of the hood and a chromium decoration on the hood tip, finally the last minor change, the tail light style changes from two layers of white/red to be the three layers red/white/red. The two variants of engines is 1.5L (in the first generation) and 1.6L (available only after some minor changes). All models were equipped with Multi-link Beam Suspension for the rear. In 1995, Nissan reintroduced the 200SX nameplate in United States and Canada to designate a two-door version of the Sentra (B14 chassis, a front wheel drive car), known in Japan and Mexico as Lucino, replacing the Sentra coupe and NX (discontinued in 1993). The 200SX came in base, SE, and sportier SE-R models. All shared their front-end appearance, front-drive chassis, dashboard, and many dimensions with the Sentra and Japanese-market Lucino. Base and SE editions shared the Sentra's twin-cam GA16DE engine 4-cylinder engine. The SE-R inherited the 140-horsepower 2.0 L SR20DE engine used in the previous 2-door Sentra SE-R. All three came with a 5-speed manual transmission or 4-speed automatic, and were equipped with dual airbags. Antilock brakes were optional in the SE and SE-R.
For the Sunny sold in Southeast Asia since 2000, see Nissan Bluebird Sylphy (N16). The Sunny was produced up to the B15 series, from October 1998 to the end of 2004. A facelifted Sunny was launched in May 2002. In 2005 in Japan, the Nissan Tiida (C11) and Nissan Bluebird Sylphy (G11) took over this market, replacing the Sunny model line. In the United States, the Sentra continued with 1.8- and 2.5-litre engines, and carries on the Sunny lineage with the B16. In Japan, the Sunny was offered with 1.3, 1.5, and 1.8-litre petrol or 2.2-litre diesel engines. Also to be noted is that while earlier North American-market Nissan Sentras were very similar to their Japan-market B-series Nissan Sunny twins, the B15 Sentra (2000–2006) diverged greatly from the B15 Sunny. The Sentra B15 body looks similar to the aero-look B14 body, while the Sunny B15 body is return to the more traditional squared-off three-box sedan design. In Japan the B15 was marketed as the Nissan Super Sunny. The Wingroad station wagon and the badge engineered Mazda Familia Van (1.3, 1.5 and 1.8-litre) continued to be spun off from the main Sunny range. A facelift for the Wingroad in 2002 gave it a new front end, though the rear was retained. The two door sedan was discontinued internationally. A new Wingroad wagon was released in 2005, based on the Tiida. Renault Samsung Motors,A South Korean Automaker was planned to use this vehicle to make Renault Samsung R-CAR project,however Renault was merged Samsung motors and Renault announced that new R-Car's based vehicle will be new SM3,However SM3 was based on Nissan Bluebird Sylphy. Although the Nissan Pulsar and Bluebird Sylphy ranges (N-series family) were a separate model line with different heritage from Sunny (B-series family), for various reasons the Sunny name was—in some markets—applied to various Pulsar/Sylphy vehicles. The Nissan Sunny name was used on the Nissan Pulsar (N13) in Europe from 1987 to 1991, which was introduced as a replacement for both the Nissan Sunny B11 Sunny and N12 Cherry. The Nissan Pulsar N14 series was introduced in 1990 in Japan and in 1991 for Europe, badged as the Nissan Sunny. It was replaced by the Nissan Almera N15 in 1996, which was itself a rebadged version of the Nissan Pulsar N15 series. Although the Bluebird Sylphy G10 did not spawn a Sunny range in Japan, it was sold as the Sunny Neo in Thailand and as the Sunny in Hong Kong, Kenya, Singapore, Sri Lanka and the People's Republic of China, where it is produced by the Dongfeng Motor Company, a joint venture with Nissan. Also, the N16 series was sold in parts of Latin America and in Europe as the Nissan Almera. From the 2007 model year, its platform changed to the Renault Samsung SM3, that is sold in parts of Europe as the Almera Classic. Also since 2007, the Renault Samsung SM3 is sold as the Nissan Sunny in the Middle East, with a solitary trim that comes with a 1.5-litre engine. The Nissan Sunny N17 was unveiled at the 2010 Guangzhou International Motor Show in China. Nissan Sunny is the Chinese market name for the Nissan Latio sold in Japan and Nissan Versa sold in the U.S. Sales began in 2011. It is also sold in the Indian market under the same name. ^ "PAACE Automechanika". sema.org. Archived from the original on 22 January 2009. Retrieved 7 July 2008. ^ "Autotest Datsun 1000 de luxe 988 cc0". Autocar. 130. Vol. nbr3803. 2 January 1969. pp. 22–26. ^ Club, Datsun 1200. "Tech Wiki - History of Datsun 1200 : Datsun 1200 Club". datsun1200.com. ^ "Origin of Sunny name". Archived from the original on 17 June 2012. Retrieved 15 June 2012. ^ "Rallying Datsuns – Part 1 (Via Webarchive)". f2.rallysportnews.com.au. Archived from the original on 13 February 2006. Retrieved 7 July 2008. ^ "We Test America's Most Economical Car". datsun1200.com. Retrieved 7 July 2008. ^ "datsun1200". datsun1200.com/modules. Retrieved 7 July 2008. ^ Clair, Michael (2 February 2018). "he life, death and rebirth of the bullpen cart". MLB.com. Retrieved 24 February 2018. ^ a b Wright, Cedric, ed. (September 1978). "Datsun Nissan South Africa uprates its 1978 LCV range". CAR. Vol. 22 no. 8. South Africa: Ramsay, Son & Parker (Pty) ltd. p. 41. ^ "Fiat. Fiat in South Africa". Car-cat.com. Retrieved 25 July 2010. ^ "Tech Wiki – Datsun 1200 encyclopedia : Datsun 1200 Club". Datsun1200.com. 7 July 2010. Retrieved 25 July 2010. ^ Quattroruote: Tutte le Auto del Mondo 77/78 (in Italian). Milano: Editoriale Domus S.p.A. 1977. pp. 554–556. ^ a b c "Datsun 120Y Review and Specs". Gumtree. Retrieved 10 April 2016. ^ "Autotest: Datsun 120Y 4-door: Latest small car from major Japanese manufacturer". Autocar. Vol. 141 no. 4065. 21 September 1974. pp. Datsun supplement 10–16. ^ "自動車ガイドブック: Japanese motor vehicles guide book" (in Japanese). 20. Japan: Japan Automobile Manufacturers Association. 30 October 1973: 90. ^ "自動車ガイドブック [Automobile Guide Book]" (in Japanese). 23. Japan: Japan Automobile Manufacturers Association. 20 October 1976: 86. 0053-760023-3400. ^ English, Adrian (December 1975). "Six new models from Datsun". SA Motor. Cape Town, South Africa: Scott Publications. p. 29. ^ Howard, Tony, ed. (October 1976). "News Models". SA Motor. Cape Town, South Africa: Scott Publications. p. 70. ^ Wright, Cedric, ed. (August 1978). "Passenger cars – Vital statistics". CAR. Vol. 22 no. 7. South Africa: Ramsay, Son & Parker (Pty) ltd. p. 141. ^ a b "YLN 302DX/302SD 1200cc (catalog)". Yue Loong Motor Co. Retrieved 4 March 2011. ^ a b Mastrostefano, Raffaele, ed. (1990). Quattroruote: Tutte le Auto del Mondo 1990 (in Italian). Milano: Editoriale Domus S.p.A. p. 1188. ^ a b "自動車ガイドブック [Japanese Motor Vehicles Guide Book]" (in Japanese). 25. Japan: Japan Automobile Manufacturers Association. 10 October 1978: 109. 0053-780025-3400. ^ a b c d Hogg, Tony (ed.). "1981 Buyer's Guide". Road & Track's Road Test Annual & Buyer's Guide 1981. No. January–February 1981. p. 88. ^ "Nissan To Introduce New Economy Car". The New York Times. 21 April 1982. Retrieved 26 March 2017. ^ World Cars 1984. Pelham, NY: L'Editrice dell'Automobile LEA/Herald Books. 1984. p. 336. ISBN 0-910714-16-9. ^ a b c Büschi, Hans-Ulrich, ed. (10 March 1983). "Automobil Revue '83" (in German and French). 78. Berne, Switzerland: Hallwag, AG: 400. ISBN 3-444-06065-3. ^ Mastrostefano, Raffaele, ed. (1985). Quattroruote: Tutte le Auto del Mondo 1985 (in Italian). Milano: Editoriale Domus S.p.A. p. 1172. ISBN 88-7212-012-8. ^ "Nissan. Nissan in Pakistan". Car-cat.com. Retrieved 25 July 2010. ^ "Nissan Sunny Ultimate Car Buyer Guide". drivearabia.com. Retrieved 7 July 2008.